These are the top five occasions we typically notice pink flowers being implemented but if it were up to me- I’d like to widen that bridge to include more areas of placement. After all, why should the color pink be solely associated with women instead of including men in this circle? A guy can be just as masculine for liking this soft shade in his bouquet as opposed to merely sticking with varieties grown in blue and green, am I right? Who’s to say pink should be off limits to men, anyways? In my opinion, is high time we change these sexist rules surrounding the shade of pink and open the doors to further exposure residing past the traditional occasions it has been used for in past years. Check out these funky varieties cultivated in the shade of pink and suggested events where they can start being showcased more often in floral arranging. Let’s start with the obvious-wedding work. This is the perfect place to start including pink, especially when talking about some of the roles men may play into. Groomsmen might be the #1 spot to promote this shade, particularly in concern with their boutonnieres. Pink roses, pink calla lilies, pink freesia and pink ranunculus are a few of the best options with this type of floral design as well as pink dendrobiums and carnations which work, too! Wedding planners and brides can have fun with extra coordination tactics by setting the groomsmen’s attire to match with pink belts, socks and ties. Their presence will reflect a happy and bright feel as they walk their bridesmaids down the aisle while also setting a tone of equality throughout the event. Ohh…. Who doesn’t love the color pink, especially when we’re talking about pink petals? 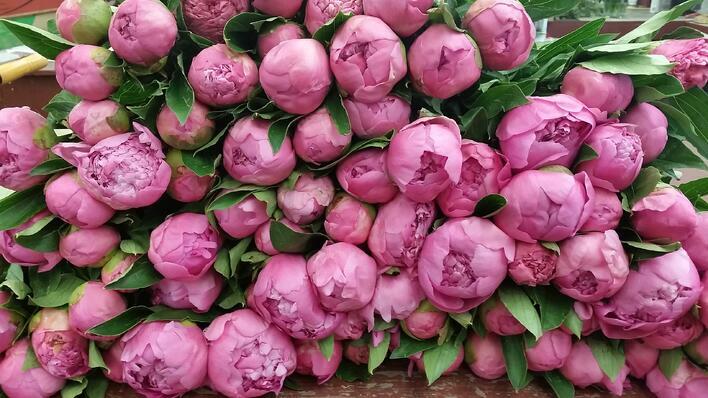 Pink flowers have always held top priority for buyers responsible for maintaining floral inventory and there’s no shock as to why. Pink is the number one most requested shade for blooms in the Boston area due to its wide variation of meaning and age appropriateness for both adults and children. Both the sweetness and innocence attributed to the hue allows pink petals to be the “no-brainer” for most when ordering for a special someone. 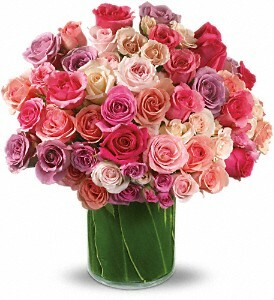 Whether it be for Valentine’s Day, Get Well, Birthday, Mother’s Day or thoughtful gift to another, pink remains the top-heavy hitter for local city flower providers. This is a good tip to think about as we slowly sail into graduation, dance recital and spring holiday territory since we’re always looking for the right present to offer. Think ranunculus, tulips or gerberas for a sentimental gesture and lest we forget the power of a bundle of sweetheart roses. Other perfect varieties that match a pink themed bouquet are peonies, cherry blossoms or a striking clump of early summer dahlias. Lilies are also another excellent option as long as the recipient enjoys a strong-smelling scent. Another reason to appreciate the color pink is the strong symbolic association with “awareness” causes. 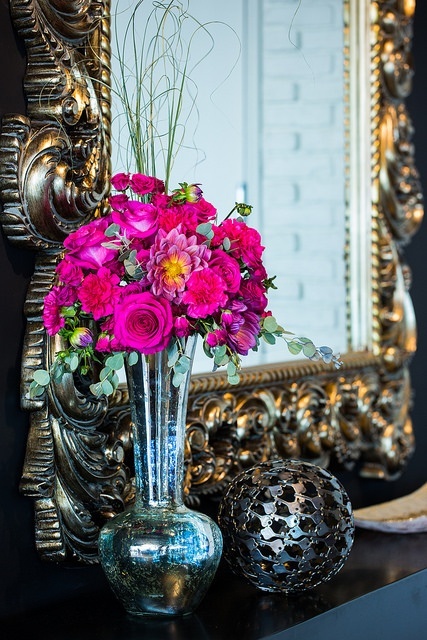 Pink has a particularly strong connection to “Breast Cancer Awareness” and continues to be the primary variety used in décor for banquets, marathons and fundraising events. The showing of a pink ribbon is synonymous with many of these efforts which is why you might see similarly shaded blooms being handed out to participants and spectators present. Pink is also a very popular color used by wedding planners who testify to the vast amount of material available in the shade including of course-the flowers. Many brides adore the soft yet notable tie to the meaning of love and have fun coming up with combinations such as blush, hot pink and magenta. In recent years, pink has taken over the wedding aisles as the preferred hue of petals that flower girls hold in their baskets as well as boutonnieres for the groomsmen and corsages for the bride’s parents. From veils of tiny blooms tucked into the bridal party’s hair to massive centerpieces holding ten to twenty species of pink colored blossoms, wedding specialists decree that this shade still steals the bridal scene.